Background and objectives Patients undergoing maintenance hemodialysis are at high cardiovascular risk. Lowering LDL-cholesterol with statins reduces the incidence rate of cardiovascular events in patients with chronic kidney disease. In contrast, two randomized, prospective, placebo-controlled trials have been completed in hemodialysis patients that showed no significant effects of statins on cardiovascular outcomes. Design, setting, participants, & measurements A post hoc analysis was conducted of the 4D (Die Deutsche Diabetes Dialyze) study to investigate whether LDL-cholesterol at baseline is predictive of cardiovascular events and whether the effect of atorvastatin on clinical outcomes depends on LDL-cholesterol at baseline. Results High concentrations of LDL-cholesterol by tendency increased the risks of cardiac endpoints and all-cause mortality. Concordantly, atorvastatin significantly reduced the rates of adverse outcomes in the highest quartile of LDL-cholesterol (≥145 mg/dl, 3.76 mmol/L). The hazard ratios and 95% confidence intervals were 0.69 (0.48 to 1.00) for the composite primary endpoint, 0.58 (0.34 to 0.99) for cardiac death, 0.48 (0.25 to 0.94) for sudden cardiac death, 0.62 (0.33 to 1.17) for nonfatal myocardial infarction, 0.68 (0.47 to 0.98) for all cardiac events combined, and 0.72 (0.52 to 0.99) for death from all causes, respectively. No such decrease was seen in any of the other quartiles of LDL-cholesterol at baseline. Conclusions In patients with type 2 diabetes mellitus undergoing hemodialysis, atorvastatin significantly reduces the risk of fatal and nonfatal cardiac events and death from any cause if pretreatment LDL-cholesterol is >145 mg/dl (3.76 mmol/L). Patients receiving hemodialysis for chronic renal failure are at increased risk of cardiovascular events (1–3). Previous studies in different patient populations showed that lowering LDL-cholesterol (LDL-C) with statin therapy reduces the incidence rate of cardiovascular events, with a greater benefit achieved in persons at high or very high risk (4,5). Although in earlier stages of chronic kidney disease or in renal transplant recipients cholesterol-lowering appears effective (6–13), two prospective, randomized, placebo-controlled trials in patients undergoing hemodialysis did not show a significant benefit of statins (14,15). 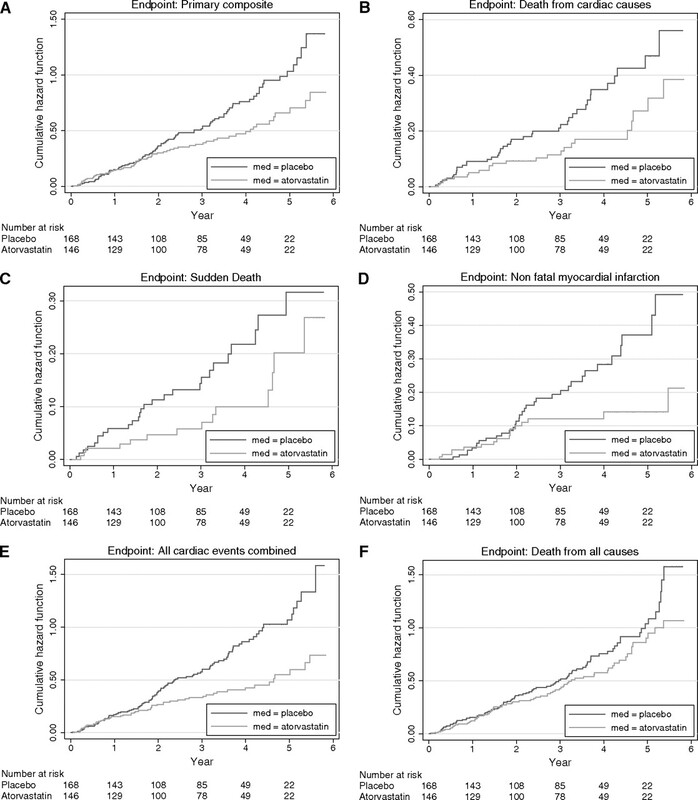 In 2778 participants of the AURORA study (A Study to Evaluate the Use of Rosuvastatin in Subjects on Regular Hemodialysis: An Assessment of Survival and Cardiovascular Events), the administration of rosuvastatin (10 mg per day) during a median follow-up of 3.8 years did not reduce the primary endpoint of combined cardiovascular events. Similarly, in the 4D study, despite effective lowering of LDL-C (38 mg/dl, 0.98 mmol/L, 42%), atorvastatin did not improve the incidence rate of the primary endpoint in 1255 hemodialysis patients with type 2 diabetes mellitus (14). Meta-analyses of prospective trials of statins have revealed an approximately 25% reduction in cardiovascular events per 39-mg/dl (1 mmol/L) decrease in LDL-C (4,16,17). Notably, these analyses have proven the principle that the relative risk reduction achieved by a certain absolute reduction in LDL-C is uniform across all strata of baseline LDL-C values (4,16). However, absolute reductions in LDL-C produced by a given dose of a statin are larger at high than at low pretreatment concentrations (18). Accordingly, statin trials commonly show higher relative reductions in cardiovascular events at high baseline LDL-C. We therefore hypothesized that the cardiovascular benefit of atorvastatin was greater at higher baseline LDL-C in 4D. Furthermore, we aimed to determine the effect of baseline LDL-C on the incidence rate of future cardiovascular events. In particular, we intended to assess whether the association between baseline LDL-C and adverse outcomes differed between the treatment groups, as it has been demonstrated in previous studies (19,20). Design and methods of the 4D study have been reported (14,21,22). The 4D study was a prospective, randomized, multicenter trial including 1255 patients with type 2 diabetes mellitus that were 18 to 80 years of age and had a previous duration of hemodialysis of <2 years. We randomly assigned patients to receive double-blind treatment with 20 mg of atorvastatin once daily (n = 619) or placebo (n = 636). Participants were followed-up at 4 weeks and every 6 months after randomization. At each follow-up visit, we took a blood sample and obtained information about any suspected endpoint or serious adverse event. For the post hoc analysis presented here, we evaluated the following prespecified endpoints also included in the primary report of the 4D trial (14):(1) combined primary endpoint (composite of cardiac death, nonfatal myocardial infarction, or stroke),(2) cardiac death, (3) sudden cardiac death, (4) nonfatal myocardial infarction, (5) all cardiac events combined, (6) all cerebrovascular events, and (7) all-cause death (14,21,22). We measured LDL-C directly by agarose gel electrophoresis with subsequent enzymatic staining for cholesterol (Helena Diagnostika). We determined “sensitive” C-reactive protein (CRP) by turbidimetry and N-terminal pro-B-type natriuretic peptide (NT-pro-BNP) by electrochemiluminescence (Roche Diagnostics, Mannheim, Germany). Other analyses were conducted using standard methods. We took blood samples before the start of dialysis and administration of heparin or further drugs and before randomization to study treatment. We examined characteristics of subgroups defined by LDL-C quartiles by calculating descriptive statistics (means and SD for continuous variables and frequencies of categorical variables). We compared the distribution of covariates across groups by using analysis of covariance (for continuous variables) or logistic regression (for categorical variables) analyses adjusted for age and gender. We used a time-to-event analysis to evaluate the prognostic effect of LDL-C on absolute risk and to obtain efficacy estimates of atorvastatin in subgroups defined by baseline LDL-C quartiles. We applied two different approaches: (1) a time-to-first event approach (Cox regression model) identical to the main analysis of this study (14,21,22), and (2) a multiple events analysis allowing for multiple events to occur in the same individual (Andersen-Gill model) (23,24). In our models, we included all significant covariates at baseline (25) that were selected for each endpoint separately using a stepwise selection procedure (forward: P < 0.05; backward: P < 0.1). Covariates were selected from the following variables: gender, age, phosphate, hemoglobin, glycated hemoglobin, ever smoking, systolic and diastolic BP, body mass index, ultrafiltration volume, duration of dialysis, arteriovenous fistula, history of stroke/transitory ischemic attack, coronary artery disease (myocardial infarction, coronary artery bypass grafting, coronary intervention, and angiographically documented coronary artery disease), peripheral vascular disease, and congestive heart failure (predominantly presenting with New York Heart Association class II). Furthermore, to evaluate the prognostic effect of LDL-C on adverse outcomes, we fitted a model including LDL-C quartiles as a categorical dummy variable using the first quartile as the reference. All statistical analyses were conducted using the statistical software package STATA (STATA Corporation, College Station, TX, USA). Table 1 shows the characteristics of study participants according to quartiles of baseline LDL-C. Of 1255 patients, all had a LDL-C measurement at baseline, 1249 had a CRP measurement, and 1058 had a NT-pro-BNP measurement. The mean follow-up period was 4.0 years (median 4.0 years) for patients on atorvastatin and 3.9 years (median 4.1 years) for those on placebo. During follow-up, 617 patients died. Furthermore, 469 patients reached the composite vascular endpoint, with myocardial infarction and stroke occurring in 205 patients and 103 patients, respectively. Patients with high LDL-C were more frequently female, had a higher body mass index, lower systolic BP, higher hemoglobin A1c, higher circulating phosphate, lower albumin, higher HDL-cholesterol, and a higher CRP than patients with a low LDL-C. They had a higher ultrafiltration volume and more frequently an arteriovenous fistula. Peripheral vascular disease was more frequent in the second and the third quartiles than in the first and the fourth quartiles of LDL-C. There were no differences between LDL-C quartiles with regard to smoking, diastolic BP, duration of dialysis before enrolment, diuretic use, history of arrhythmia, coronary artery disease, congestive heart failure, cerebrovascular disease, triglycerides, or NT-pro-BNP. Table 2 shows the results of a comparison of incidence rates in subgroups defined by baseline LDL-C. Because the prognostic effect of LDL-C is likely to depend on whether patients were on lipid-lowering treatment or not, we separately evaluated randomization groups. In the placebo group, both types of analyses (time-to-first event and multiple events) revealed higher adjusted hazard ratios (HRs) for the combined primary endpoint in the fourth quartile than in the preceding ones (not statistically significant). The tendency toward higher event rates at high baseline LDL-C was not seen in patients who received atorvastatin. Corresponding findings were obtained when we considered nonfatal MI, all cardiac events, and total mortality. The adjusted HRs of cerebrovascular events increased in parallel to LDL-C in the placebo and the atorvastatin group. Atorvastatin treatment showed similar relative reductions of LDL-C across quartiles of baseline concentrations (Table 3). However, only in the fourth quartile of LDL-C (>145 mg/dl, 3.76 mmol/L) did atorvastatin treatment show significantly decreased cardiovascular events. The risk of the primary endpoint was reduced by 31% (HR 0.69, 95% confidence interval [CI] 0.48 to 1.00), cardiac deaths were decreased by 42% (HR 0.58, 95% CI 0.34 to 0.99), and sudden cardiac deaths were decreased by 52% (HR 0.48, 95% CI 0.25 to 0.94). Similarly, the risk to experience a nonfatal myocardial infarction decreased by 38% (HR 0.62, 95% CI 0.33 to 1.17), the risk of any cardiac event decreased by 32% (HR 0.68, 95% CI 0.47 to 0.98), and the risk to die of any cause was lowered by 28% (HR 0.72, 95% CI 0.52 to 0.99). These benefits of atorvastatin treatment were not seen in any other LDL-C quartile. Furthermore, atorvastatin did not meaningfully affect the risk of cerebrovascular events at any LDL-C concentration (Table 4, Figure 1). Cumulative incidence of cardiovascular events according to medication group in participants of the 4D study with an LDL-C in its fourth quartile at baseline (≥145 mg/dl, 3.76 mmol/L). (a) Cumulative incidence of the combined primary endpoint (cardiac death, nonfatal myocardial infarction, or stroke). The HR for atorvastatin, as compared with placebo, was 0.69 (95% CI 0.48 to 0.69). (b) Cumulative incidence of cardiac deaths, for which the HR in the atorvastatin group was 0.58 (95% CI 0.34 to 0.69). (c) Cumulative incidence of sudden cardiac death, for which the HR in the atorvastatin group was 0.48 (95% CI 0.25 to 0.94). (d) Cumulative incidence of nonfatal myocardial infarction, for which the HR in the atorvastatin group was 0.62 (95% CI 0.33 to 1.17). (e) Cumulative incidence of any cardiac event, for which the HR in the atorvastatin group was 0.68 (95% CI 0.47 to 0.98). (f) Cumulative incidence of death from any cause, for which the HR in the atorvastatin group was 0.72 (95% CI 0.52 to 0.99). This analysis of the 4D study demonstrates that atorvastatin significantly decreased adverse fatal and nonfatal cardiac events and all-cause death compared with placebo at a baseline LDL-C ≥ 145 mg/dl with no significant effect of atorvastatin below this threshold. Thus, this is the first evidence from a prospective study that lowering LDL-C in dialysis patients may be of clinical value if pretreatment concentrations are sufficiently high. This is supported by the finding that in the fourth quartile of LDL-C the incidence rate of most cardiac endpoints and of death was higher in the placebo than in the atorvastatin group, which corresponds well with the clear association between cholesterol and cardiovascular disease shown in other studies (26). In contrast to these findings in our placebo group, lower cholesterol has been associated with higher mortality in observational studies of hemodialysis patients (27–31). It has been speculated that such a paradoxical association reflects reverse causation (i.e., advanced cardiovascular disease might cause inflammation, malnutrition, and lower cholesterol). It may hence be of substantial interest that in the study presented here the common features of the wasting syndrome (low body mass index, low albumin, inflammation) did not cluster at low LDL-C. Rather, lower albumin and higher circulating CRP were found in common with a high body mass index at the two upper quartiles of LDL-C. A potential explanation for this may be the presence of residual renal function and proteinuria. Loss of albumin through the urine results in upregulation of HMG-CoA reductase and downregulation of the LDL receptor, events that lead to the elevation of LDL-C (for review see 32,33). Because information on residual renal function and proteinuria has not been collected, we analyzed surrogate parameters such as ultrafiltration volume, diuretic use, and time on hemodialysis. We did not detect differences of these factors across the quartiles of LDL-C and therefore consider it unlikely that residual renal function or protein loss accounted for increases in LDL-C. Alternatively, one might speculate that patients with higher LDL-C are still well nurtured (high body mass index and high phosphate) and that their adipose tissue produces proinflammatory cytokines or less adiponectin, which would in turn raise CRP and decrease albumin (34). There may be several explanations for the lack of efficacy of atorvastatin at lower LDL-C. Causes of adverse outcomes vary between patients on dialysis: on the one hand, cardiovascular death is more common at high LDL-C; on the other hand, infectious disease is more common at low LDL-C (29,30). Furthermore, in patients with low LDL-C the pathways leading to fatal and nonfatal cardiac events may involve left ventricular hypertrophy and aortic calcification—distinct from atheroma formation at high LDL-C (1). Statins are effective in hypercholesterolemia, but also in the absence of marked hyperlipidemia but at elevated levels of CRP (35–37). Risk reduction attributable to statin therapy may be greater among patients with evidence of inflammation than among those without (35). Consequently, an anti-inflammatory effect of statin therapy independent from LDL has been postulated (35,38,39), and it has been suggested that CRP is not only a risk marker (40) but also a risk factor (41), which is controversial (42). The JUPITER trial (43) has claimed that statins yield clinical benefit in persons with moderately elevated CRP despite “normal” LDL-C. In the study presented here, patients with LDL-C ≥145 mg/dl (3.76 mmol/L) who experienced clinical benefit had a median CRP of 11.6 mg/L. In contrast, patients in the third quartile of LDL-C (123 to 145 mg/dl, 3.19 to 3.76 mmol/L) had an even higher median CRP (13.4 mg/L) and did not benefit. At least in hemodialysis patients, CRP thus does not contribute to the identification of persons who benefit from statins. In trials of statins, the relative reduction in cardiovascular events is linearly related to the absolute reduction in LDL-C (one-quarter less per 1-mmol/L or 39-mg/dl decrease) across a broad range of pretreatment LDL-C (4). In contrast, absolute reductions in LDL-C by statins are greater at high baseline LDL-C (18), which also applies here (cf. Table 3). It is therefore not unexpected that atorvastatin reduced cardiac events more effectively in the highest LDL-C quartile. This is in complete agreement with previous trials such as the Scandinavian Simvastatin Survival Study (19), the Long-term Intervention with Pravastatin in Ischemic Disease trial (20), the Cholesterol and Recurrent Events trial (44), the Pravastatin or Avorvastatin Evaluation and Infection Therapy–Thrombolysis in Myocardial Infarction 22 study (45), or the Prospective Study of Pravastatin in the Elderly at Risk (46). In the Heart Protection Study, the relative risk reduction was apparently independent of baseline LDL-C (47). This may relate to the fact that in three groups with LDL-C of 104, 123, and 143 mg/dl (2.69, 3.19, or 3.70 mmol/L, respectively) at randomization, the relative differences in LDL-C between placebo and simvastatin were different (33%, 30%, and 27%). As a consequence, the relative reduction in LDL-C was lowest in the group with the highest starting level, and the event reduction consequently failed to be greater in this group. How can our findings be reconciled with other evidence in regard to the value of statins in hemodialysis? In addition to 4D, the AURORA trial enrolling 2776 patients undergoing hemodialysis to receive rosuvastatin (10 mg daily) or placebo did not demonstrate any significant effect of rosuvastatin (15). The AURORA investigators also undertook a subgroup analysis and did not detect any benefit of rosuvastatin according to baseline LDL-C (15). However, scrutiny of the AURORA data suggests greater clinical efficacy of rosuvastatin within the highest tertile of LDL-C: In the two lowest tertiles (LDL-C < 111 mg/dl, 2.87 mmol/L), the incidence rates of the primary endpoint were almost identical in the verum and in the placebo group (29.1% and 28.1%, respectively) (15). In the third tertile (LDL-C 111 to 144 mg/dl, 2.87 to 3.76 mmol/L), the event rate was approximately 17% lower on rosuvastatin than on placebo (27.0% and 32.4%, respectively). Although the relative reduction in LDL-C was almost identical in 4D and AURORA (43% compared with 42%), baseline average LDL-C was lower in AURORA (100 mg/dl, 2.59 mmol/L) than in 4D (126 mg/dl, 3.26 mmol/L), and very few participants of AURORA may have had a baseline LDL-C ≥ 145 mg/dl (3.76 mmol/L). Thus, an even greater relative risk reduction might have been seen at the high end of the LDL-C scale if AURORA would have included more patients in the range of ≥145 mg/dl (3.76 mmol/L). The Study of Heart and Renal Protection (SHARP) (48,49) has very recently evaluated the effect of LDL-C in more than 9000 patients with a broad spectrum of renal disease (clinicaltrials.gov/ct2/show/study/NCT00125593; http://www.ctsu.ox.ac.uk/∼sharp/). Patients (n = 6247) with chronic kidney disease not yet requiring dialysis and 3023 patients on hemodialysis or peritoneal dialysis were allocated to placebo or a combination of 20 mg of simvastatin and 10 mg of ezetimibe daily. There was an overall significant reduction of the primary endpoint (myocardial infarction, coronary death, ischemic stroke, or any revascularization procedure combined) by 17%. However, event reduction did not reach statistical significance among the more than 3000 dialysis patients of the trial: Incidence rates of the primary endpoint were 15.0% and 16.5% in the ezetimibe and simvastatin group compared with the placebo group, respectively. Intriguingly, this corresponds to a relative reduction in the primary endpoint of 9.1%, which is almost identical to the relative reduction of the primary endpoint in 4D. No information has been disclosed so far regarding the relationship between baseline LDL-C and clinical outcomes in SHARP. Furthermore, because the effects of ezetimibe and statins on the metabolism of LDL may be crucially different (50), the results of SHARP cannot unreservedly be compared with those of 4D or AURORA. However, pooling the results of 4D, AURORA, and SHARP would certainly allow further insights into the effectiveness of cholesterol lowering in dialysis patients at ample statistical power. A limitation of the analyses presented in this paper is that they were not predefined. Therefore, confirmation is still needed by an adequately powered randomized clinical trial. In conclusion, our post hoc analyses demonstrated a substantial reduction of adverse clinical events in a subgroup of participants of the 4D study with an LDL-C ≥ 145 mg/dl (3.76 mmol/L). Our findings suggest that statin treatment might be considered in patients with diabetes mellitus on hemodialysis with appropriately elevated LDL-C levels. The 4D study was supported by Pfizer, Inc. W. März received consulting fees, lecture fees, and research grants from Pfizer. B. Genser and C. Wanner received grant support from Pfizer for post hoc analyses of the original 4D study. C. Drechsler, V. Krane, T.B. Grammer, E. Ritz, T. Stojakovic, H. Scharnagl, I. Holme, and H. Holdaas have no conflict of interest to report. We thank the investigators and study nurses involved in the 4D study (list available at www.uni-wuerzburg.de/nephrologie). Special thanks go to the medical endpoint monitors (Z. Ülger and F. Swoboda), to the endpoint committee (J. Mann, J. Bommer, P. Schanzenbächer, P. Schollmeyer, and M. Schartl), and to the laboratory staff at the Universities of Freiburg and Würzburg. This work has also been supported by grants from the Bundesministerium für Bildung und Forschung (BMBF01 EO1004).